i remember when con was released. it was very strange and unexpected (at least it was for me), my account got stuck online that day. go figure. I also remember being a great player back in classic, but now that account is lost forever, since there is no switching.,.. Edited by GLADIATORS, 04 July 2009 - 2:15 PM. I remember thinking I was trapped in Lumbridge. You see, I though Lumbridge and Al Kharid were the only two cities in the game, and when I didn't have the 10 gp to pass through the Al-Kharid gate, I thought I was trapped in Lumbridge. I remember spending hours killing cows for their hide, and then trying to sell each inventory in Lumbridge square. I didn't grasp the concept of banks, I thought that stuff would be gone forever. I took me at least three hours to make 1,000 gp. I remember the rule no luring came out. It was funny because that was just when I started watching Jojo30090's videos. My real life friend and I wanted to lure so bad. That failed. I remember voting on runescape.com's poll. I was the 2nd person to vote. I thought it was pretty cool, but didn't screeny. I remember the old RuneScape log-in interface. Man, that was horrible compared to what we have now. It's so different! I remember all those scams (I'll trim your armor; **** It won't let you say your password, look! ; Drop your items and press alt-F4 and you'll duplicate your items; etc.). I actually fell for the password trick. I was on my brother's account and he ended up getting hacked. He hated me for a week. Edited by Maxman, 07 July 2009 - 4:31 PM. I remember in Classic, it was rare to see someone in full rune. I remember when you would be woodcutting, a tree would appear in a thought bubble, a fish when fishing, and a pick when mining. I remember having to click on the fishing spot after -each- fish caught. I remember those horrid sleeping bags. I remember the RS2 beta, and when the game finally switched from classic to new graphics, I didn't want to switch. I remember when Runecrafting came out. I remember when Slayer came out. I remember when Barrows came out, and people were claiming they were too powerful compared to dragon. I remember when Construction came out, and people started selling whips for 1.8m, the lowest price yet. I remember getting scammed for the first and only time, when I was selling a rune scim for 40k (gotta love prices back then), and only getting 4k for it. I remember I made my first 1m by spinning flax into bowstring, then proceeded to spend that 1m of a d med. I remember before Farming came out, you could kill farmers for seeds and farming gear. I remember the changes to staking and the riots, followed by the removal of pking and those riots. I remember how hyped up Summoning was. I used to mine iron east of varrock with a mith pickaxe. Then i'd go to al kharid and make them into steel bars. Then i'd go to varrock and make them into steel armor. The road from varrock to al kharid was the only road I used for like a week, it was all I knew in runescape. This was my way of making money back in the old days. Needless to say I didn't made alot of cash lol. I wanted black armor so I sold enough iron armor to the shop to be able to buy full black :D Then someone offered me to trim my armor. Back in the days I wasn't aware of where trimmed armor came from or how you obtained it so I trusted this person and gave him my full black. Needless to say what happend. So I decided to earn my money back and to buy black armor again ... got offered to trim my armor again and I thought that this guy may be more honest. Lost full black armor again. Eventually I earned enough money back to buy yet another full black set and I had learned my lesson with the armor trim scam. 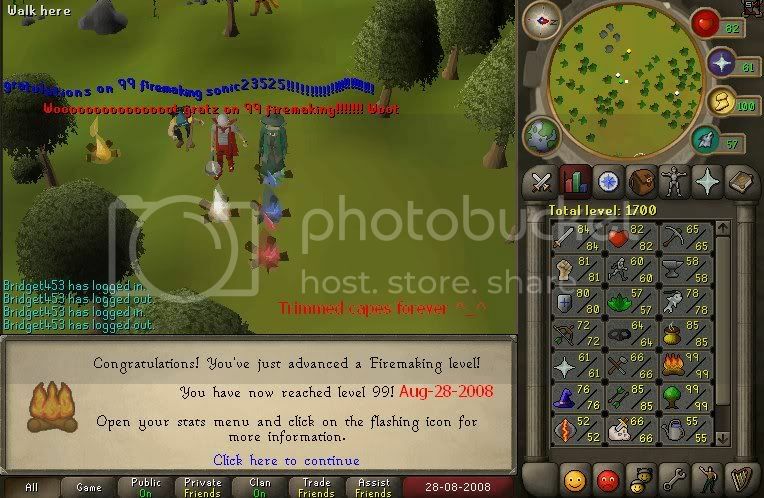 Even though I can be considered pretty nooby back then it were amazing and fun times :D times which I don't really have in runescape anymore. Now that I know all about RS I wont hear about an amazing store which sells amazing stuff in a far distant (and unknown to you) city. I remember getting lost in East Varrock during my first month or so playing the game. And I remember finally finishing all the f2p quests a few months after getting members. There was also the time I lost my first set of rune :( I was killing lessers on top of Crandor and lagged out and died. And of course, the first clan. Nobody ever forgets their first clan. Mine was Brotherin clan in March 07 -- they merged with Rikku around July/August of the same year, and later died. I remember Queenvix's memorial PK in early May 07, I went with SA a few days before my band trip. First one dead. GF me. Hmm. I also remember my first war -- with SA in CWA. August 08. Pretty sure it was against KTS. Umm, then there was learning to tank :) Thanks to Noonshade0, Xtozze, and Cantstopal13 mostly. <Mattbrazil_2> as I walk through the shadow of the valley of death, I fear no evil for my bank pin is with me. - Needing my friend to show me to Varrock. - Finding an uncut ruby on the ground. My friend said it was his so he traded me a staff for it. - Being attacked by a mugger and saved by a level 35 in mithril armor. - Falling for the "grab the zamorak wine and get 10k" trick. - Trekking randomly around runescape with my friends. - Finally becoming a member. - Thinking the Tzhaar Fight Caves were an awesome training ground. - Buying granite armor for ridiculously high prices thinking it was awesome. - Getting 60 attack and my first dragon longsword. - Finally finishing Dragon Slayer. - Getting my first abyssal whip. "Si Hoc Legere Scis Nimium Eruditionis Habes." 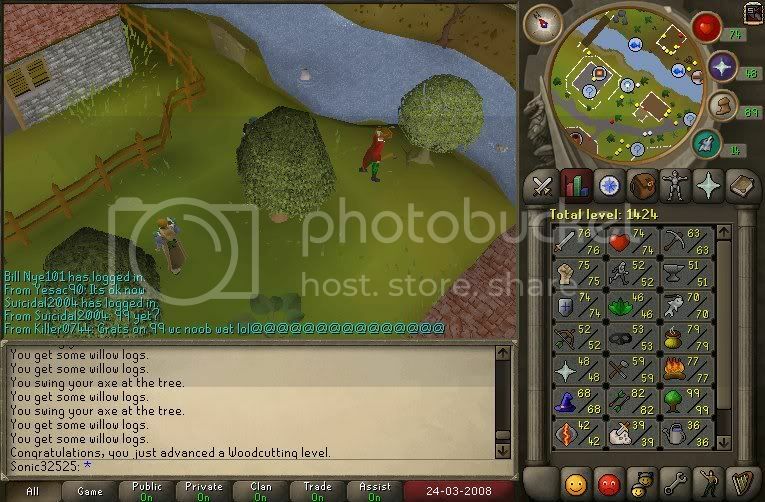 I remember 5 years ago when I was in lumbridge and I was 12 years old and begging for cash Noobshow style :P.
I got 2k from a guy and went CRAZY!!!! Former member of the Events and Blog team. Ex- High Council of the #1 Pure Clan Fatality. i remember 7 years ago. haha. logging in, making my account all that. i remember when I was wandering around as a low level and classic was confusing as hell. I remember killing a level 101 in level 30 something wildy way back when barrows first came out. I was level 70 and i saw him. He had 1/4th of his health left and i poisoned him with my DDS. He ran and before he made it out of the wildy he died, leaving me guthan's spear and helm. That was a very proud moment. i remember my first time in runescape, i couldn't get out of the training lvls (x about 4years ago. when i was finally came in lumbridge and sow some guy with 150gp i thought he was rich (:. , i took my real life friends for a trip (: we were with 9 or something it was fun (:. later i began my first pure together with a real life friend who made also 1 we made a lot of fun in wildy we trained our skills in wildy (:, it was a lot of fun . made a lot of money with it. afther wildy update i quitted for few months and started playing on and off. I remember doing tutorial island for the first time and thinking this game was really confusing. I remember saving up to buy full rune with a chain to do dragon slayer and it turned out to be really easy at like 70 combat. I remember when people used to pk in dhide with a magic shortbow. I remember when i fell for the if you say your password it gets censored trick and getting really annoyed. I remember when me and my friends went to kill cows together and thinking we were amazing. I remember the good times of RS when we weren't covered in cotton wool and protected from everything by Jagex.